Naples attraction-guides.com - Naples, Italy attractions guide Naples Acquario (Aquarium) information about attractions, open hours, admission charges, tanks, marine fish, location and address details, Stazione Zoologica, tel / telephone number, general tourist information about Acquario (Aquarium) in Naples (Napoli) area, Italy (Italia) IT - Last updated 30/10/2012. 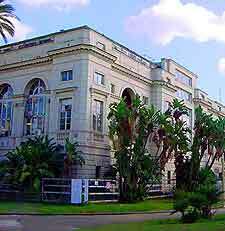 The Naples Acquario (Aquarium) is the oldest of its kind in the whole of Europe and was originally founded by a German naturalist at the end of the 19th century. Located in the public garden on Via Caracciolo, the Naples Acquario (Aquarium) is a popular tourist attraction in Naples, for both children and adults alike. The Naples Acquario (Aquarium) is home to more than 200 different species of fish and marine plants, all of which are well displayed and thrive in large, well-landscaped glass tanks.